Sometimes we feel like having some Southern Style comfort food for breakfast, especially on the weekends. While this recipe may take a little bit of time to prepare (assuming that you don’t already have some of our Keto Country Biscuits prepared and laying around), it is totally worth it and we dare say it tastes like the real deal. Growing up as a young kid in the South gave me an appreciation for thick and satisfying comfort foods, and that may have been part of the reason that I was a bigger kid in elementary school. I developed some of my cravings, and unfortunately some of my eating habits down there that I carried with me for the rest of of my life so far. Now that I have switched to eating a ketogenic diet I sometimes have those cravings but don’t want to cave into the cravings and cheat on my diet. Truth be told, this recipe tastes so good that I have actually begun to prefer the taste of it over the good old fashioned country gravy made with wheat flour. It’s just that satisfying! 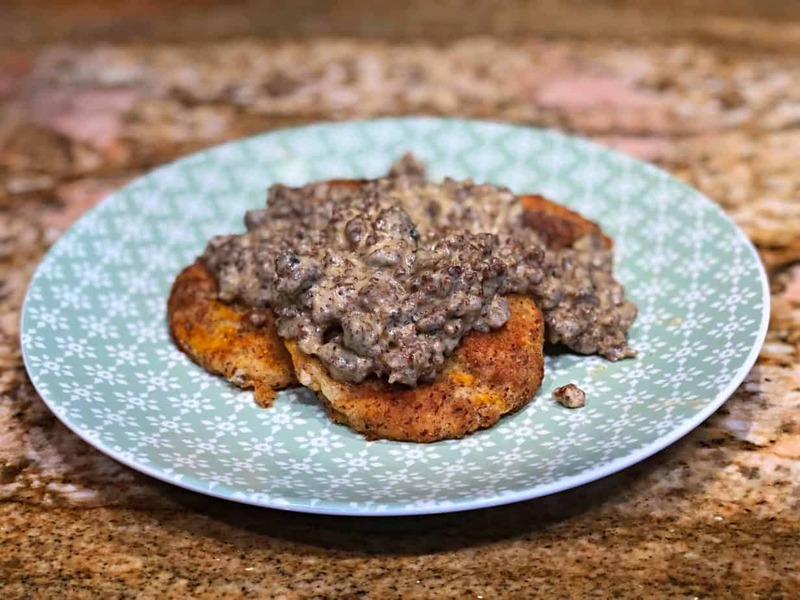 Check out this recipe for Keto-friendly Biscuits and Gravy and be sure to leave me a comment about your thoughts! What are your favorite modifications to the recipe that make it taste more like the biscuits and gravy you grew up with too? For the biscuits use our recipe here. First you will want to prepare our Keto Country Biscuits ahead of time, click for recipe. After the Cream Cheese has mostly melted and been stirred evenly throughout the sausage, pour in the 1 Cup of Heavy Whipping Cream. Add additional Black Pepper to your liking while simmering the mixture until reduced to the thickness you desire. NOTE: This will produce a rather thick and hearty gravy, which is our personal preference. If you prefer a thinner gravy you can add tap water in small amounts to the mixture to thin it out. If you make it too thin, you can thicken it back up with Xanham Gum if you happen to have any. You should include a print option. Chris, I can look look into adding some sort of button, but generally you can print by default from your internet browser. Sometimes u can’t get it 2 print that way. I’ve tried different ways & it never works. Is this low carb? I’ve had a few mentions about getting “Printer-friendly” recipe versions. I will have to see if that means I will need to make a downloadable document for them or something. Not something to be eaten everyday of course. Just something yummy for that occasional craving when you don’t want to officially make it a cheat day. 1530 mg sodium in a plus-portion size serving is not too much for a Keto woe since 5000 is the daily recommended sodium for electrolyte support. I would personally have a smaller portion – problem solved. Sufficient potassium is a challenge too so some could be swapped out by using Lite Salt, if there is a concern ???? Keto WOE makes you lose a lot of sodium. You will find that you will have to add sodium to your diet if you do Keto properly.. You do not have to cut back on the sausage or the cheese. whatever. Those are mostly things that make your food shelf stable longer. I saw some research articles a couple weeks ago suggesting as much as 6000 mg/day. Before you stroke, remember the idiots telling you you’ll die with all that fat as they kill thrmselves with. sugar. Ok. Crawling back into my cozy hole ????. I totally again with Shereen. I’ve had kidney problems for over twenty years. I know that if I eat more than 800 mg of sodium per day, my kidneys will be totally wiped out within a year. I love new recipes, but no one realizes how harmful salt is… let’s get new recipes that doesn’t have thousands of mg of sodium……..I live and enjoy my food so much more without salt….try it people. Where do I find the biscuits? this looks yummy! where’s the biscuit recipe ????? I see the one for the sausage gravy, but nothing for this. So many people trying to get my biscuits! Use this recipe but leave out the Garlic Powder and use more mozzarella where it uses the Cheddar in that step. I am epileptic and have been on the ketogetic diet for over a year now I went from having Grand mal seizures (biggest) to absent seizures (smallest) these recipes will definitely help. What recipe do you use for the biscuits? But I leave out the Garlic Powder and substitute additional mozzarella instead of the cheddar. This is great! But you only show us how to make the gravy! The biscuits are going to be carb crazy. How do we make those? Besides people don’t take a minute and read your instructions on where the biscuit recipe is, at times the link doesn’t want to work. I’ve had to back all the way out of FB and come back more than once to get your wonderful recipes. Today it has taken almost 3 hours to find and copy those. About 10 including the biscuits. I think it’s a FB issue on iPhones. ????. And thank you for your wonderful recipes, tips and sharing them for free. Are you looking for like a recipe book? I haven’t had time to make one of those YET, but I could say that in the future I could put something like that together as I get more of my recipes published here on the site. 🙂 Thank you for your interest and support! I am also allergic to Casein or Cows Milk…would be great to have a recipe for gravy that didn’t include dairy!! Otherwise this recipe is great!! For another day, another recipe perhaps. This gravy is pretty much ALL dairy. My DIL is allergic to cows milk. There are all kinds of milk becoming more readily available. We found out through Dr Gundry’s book that European cows have s different casein than most cows in the US. Readily available in upstate SC are sheep and goat milk. Different casein. She buys in several groceries and the local farmers market. I prefer the nut milks for different reasons. I’ve been making sausage gravy with them and the almond or coconut flour. That suited my taste buds and DH liked all the heavy cream. You can work out the carbs if you try that, ad he said, it’s not something I eat every day. And it’s still pretty low in carbs. There is no recipe for the biscuits. Where can I find the recipe for the biscuits? A friend of mine sent me your Biscuits and Gravy recipe on Facebook. I am so glad that she did. I just absolutely love biscuits and gravy and I truly thought that you could not eat it when you are on a low carb, no carb diet. Boy was I wrong!! This taste Absolutely Wonderful!! I truly thought that when you are on a diet like that everything will taste really plain that I would not be able to use any spices. Well I was wrong there too. Thank you for making it taste so great. Beverly, I am so glad that you enjoy them as much as I do. My goal it so make the most interesting dishes that I can dream up that replace all the food that people tend to feel like they are missing while eating keto. There is no reason for this diet to be boring. When you think about it all you really are doing is getting rid of sugar, grains, and some fruits. Outside of that you just have to reinvent some of your old favorite recipes. O.M.G! Absolutely delicious! I added grated parmesan to the biscuits when baking them. Turned out great. Haven’t had B&G since March. Will be having that a lot more! I liked it way more than traditional sausage gravy. The creaminess is way better than the watered down flour mix most gravies have. Do you have receipes that are lactose free also? Some of my recipes are, but many of them contain cheese or butter in them as a way of getting in the necessary fats. I’m curious what you eat for fats without being able to eat lactose. Maybe something I can learn here. I appreciate you’re caring and taking the time to develop and post these recipes. Thanks so much! I’m definitely going to make this. Do you think that the gravy would be good the next day?? It would still be good, I would make it a little thinner if you were going to refrigerate it for the next day so that it doesn’t get absorbed up. Thank you very much for the wonderful recipe. I was able to follow it almost exactly, and my biscuits turned out tasting like the cheesy biscuits found at red lobster or other kinds of seafood restaurant. Thank you so much, and I’m excited to continue following your recipes. Made the gravy this morning. We are not a keto family, but trying new things and trying to cut some of the carbs. I used regular biscuits. The only change I would make is at least partially draining off the sausage. I ended up spooning the grease, there was way too much floating on top of the gravy. It was really filling. I LOVE this recipe. I have now made it twice, and my husband and teenage son literally hugged me when they heard I was making it again. It is really filling, so it doesnt take a large portion to make it a filling meal. I decided to make a double batch this time to have more leftovers. I use the ground breakfast sausage from aldi, and dont add any salt or pepper. I also put ALL the mozzarella cheese in the microwave because I didnt read the whole recipe first, and they turned out awesome. Thank you so much for this yummy treat!